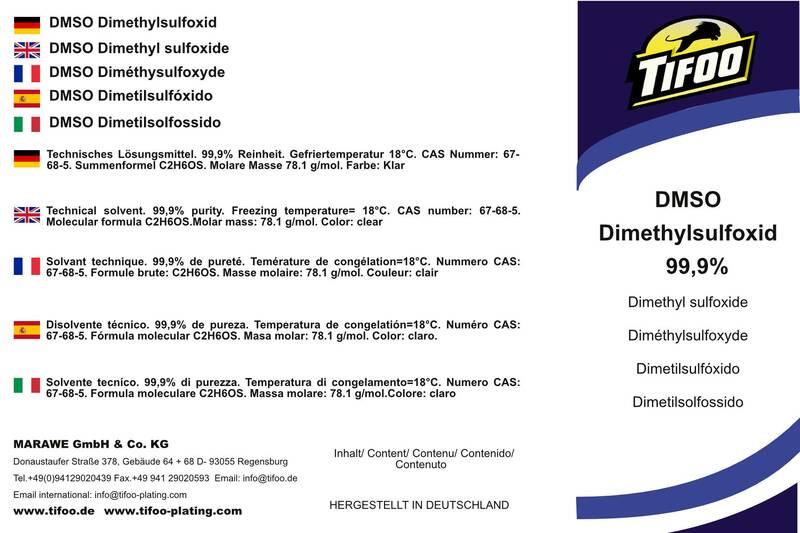 Product information "DMSO / Dimethyl sulfoxide"
++++ Purity certificate on demand! Excellent solvent for all kinds of technical purposes, uses and applications. 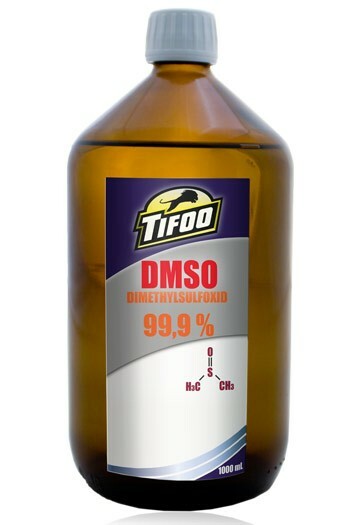 DMSO is an excellent solvent for numerous organic substances, like e.g. adhesives, dyes, grease and many more. It's nearly odourless, has a high boiling point and is non-combustible. --- Very high purity of 99.9 % --- DMSO is also known as carrier and effect enhancer. As substances that are dissolved in DMSO can penetrate the skin, a cautious handling is essential. DMSO is an important solvent for numerous applications and conceived for the use in synthesis and technology. We don't assume any liability for using DMSO for medical purposes. Important notice for storage: Dimethyl sulfoxide freezes at a temperature of under 18 °C and only becomes liquid again when exposed to higher temperature, when it is as highly pure as ours. When the dimethyl sulfoxide is grozen, e.g. after transportation in winter, we recommend to put the bottle carefully into warm water until it's liquid again. We offer you this solvent in technically high purity of 99.9 %! If you have any questions, we will be happily at your disposal. Click here for further information on DMSO! Related links to "DMSO / Dimethyl sulfoxide"
Customer evaluation for "DMSO / Dimethyl sulfoxide"
Gold tank plating solution "Chamaeleon"
Subscribe to the free Tifoo newsletter and ensure that you will no longer miss any of our offers or news. Copyright © Tifoo-Plating - MARAWE - All rights reserved.